In this paper we introduce a new model describing the behavior of auxetic materials in terms of a phase-field PDE system. More precisely, the evolution equations are recovered by a generalization of the principle of virtual power in which microscopic motions and forces, responsible for the phase transitions, are included. The momentum balance is written in the setting of a second gradient theory, and it presents nonlinear contributions depending on the phases. The evolution of the phases is governed by variational inclusions with non-linear coupling terms. By use of a fixed point theorem and monotonicity arguments, we are able to show that the resulting initial and boundary value problem admits a weak solution. 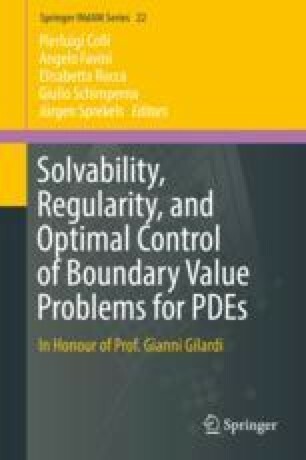 This paper is dedicated to Gianni Gilardi, with friendship and gratitude. They are negative when the φ i ′ s are negative. They are different when pulling, trσ > 0, and pushing, trσ < 0, as required. Note that, it is not constant but it is positive. Hence, one could rewrite the model in terms of ν i instead of the φ i (i = 1, 2) as state quantities. which is almost a line (a line in the small perturbation assumption). In this section of Appendix, we propose another possible extension of the model presented in , where the austenite-martensite transition was studied by a phase field model and from which this paper has moved. Indeed, in the paper , the austenitic phase ends, when the dilatation reaches a default threshold, while the auxetic phase does not cease, when it is subjected to a progressive compression. It seems appropriate to amend this last feature, considering a lower limit to the auxetic phase: when the compression reaches a threshold value, the body recovers an elastic behavior.